Brown Trout -15th March. - 6th Oct. Shooting - 1st Sept. - 20th Feb.
Seatrout - 25th Feb. - 31st Oct. I regard myself as being fortunate enough to have enjoyed trout fishing and wild fowling throughout Orkney for the last 30 years, the last 20 of which I have spent ghillieing and guiding. Orkney trout fishing has so much to offer the visiting angler, with each loch having its own unique charm and appeal. 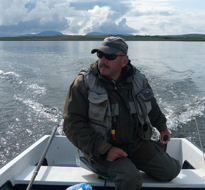 I am perfectly placed to offer an angling experience tailored to your own wishes, or from an itinerary drawn up by myself, taking in to consideration the weather, time of year and which loch is fishing well. 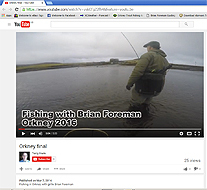 Fishing the “Trophy lochs” in the North Isles, and Clumly, Skaill, on the Mainland for what could be a trout of a lifetime, and sea trout fishing from Orkney beaches are particular specialities which I offer. Fly dressing is another one of my passions, so both the traditional and latest successful patterns are always available for my customers. All of the boat fishing is from a Scapa Drifter, which are a particularly safe, spacious and comfortable model of fibreglass boat, complete with swivel seating and 15HP outboard. This outfit is easily transported to any loch to suit conditions and clients wishes. This allows the angler the opportunity to enjoy many of the lochs on Orkney in a visit, as opposed to just the few with boats for hire. There are very odd occasions where boat fishing is not possible due high winds, but wading the sheltered shore can still be productive and this option is always available. Orkney can provide exciting sea trout fishing along its many miles of beaches. Years of fishing for these sometimes elusive fish, has given me a wealth of experience as regards location, tides, wind direction, time of year, to be able to put you in the right place at the right time, giving you the best chance of fish. If required, I can supply top of the range fly fishing equipment, rods, reels etc and a personal fly tying service, either before or during your visit. The cost for a boat and Ghillie for the day on the loch of your choice is £140 for an 8 hour day, with times being dependant on weather forecast etc, but normally out fishing for 9am and back in for 5pm. A day at the sea trout would at similar rates.